There are days when I just amaze myself with the ways I can find to procrastinate and avoid finishing something – and not for lack of desire for a finish. I finally went back to one of those older, languishing projects – I first mentioned it here on October 12, 2012. So, yes, it’s been sitting, nearly finished for at least six months. So closed to finished, in fact, that it only took five hours of hand-quilting this week to complete. 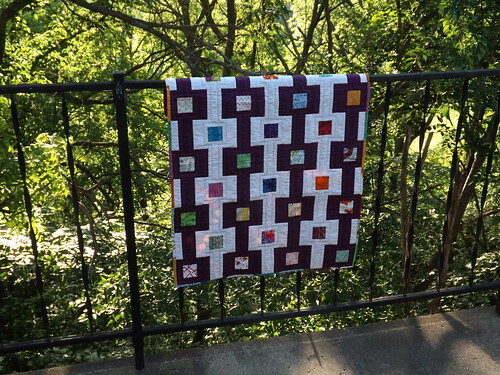 The quilt measures 27.5″ X 37″, and is made entirely from scraps and stash, with the exception of the Presencia thread purchased for the hand-quilting. I did a combination of machine and hand-quilting on this project. All the machine quilting was in the ditch. Obviously, I went with a scrappy binding – though I only used fabrics that were represented in the scrappy squares in the top. I love the backing fabric – it’s a favorite print from Joann’s. I love those large polka dots! Hand-quilting was accomplished after the machine quilting was done, and after I’d already affixed the binding. 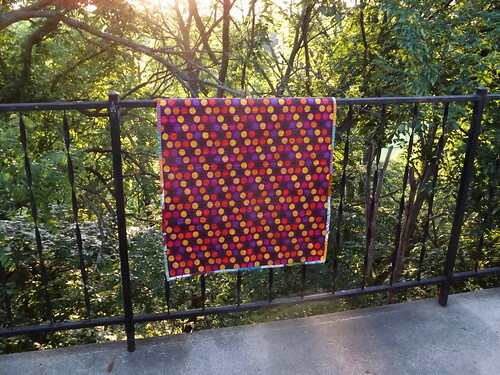 By doing it this way, I was able to hand-quilt in the car to and from work, without wrestling with a hoop. Overall, quite pleased, and this would have been a project that could have been turned around in a couple of weekends, had I stuck with it. Also linking up to i have to say…’s Show and Tell Tuesday. 🙂 I think most of us suffer from crafty ADD. What fun would this be other wise?